On the tea plantations in India, there is a system for looking after the babies and infants. 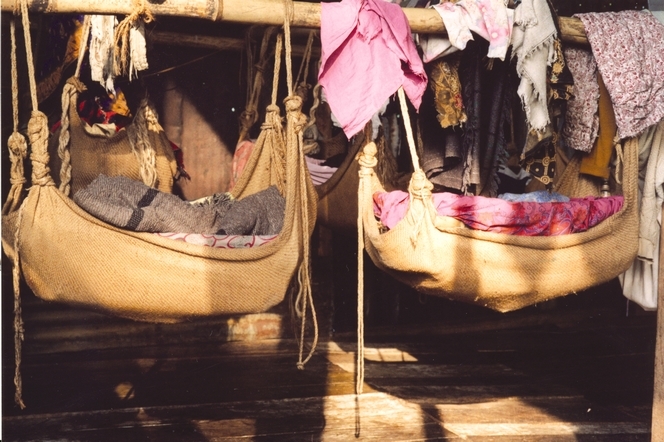 The babies are placed in hanging cribs while their mothers pluck the tea leaves in the fields. There is no roof, just a canopy. The mothers take turns to look after the little ones, rocking them while they sing lullabies. As you walk around the tea plantations you often hear their gentle singing. Let’s get back to our little seed of the tea plant. 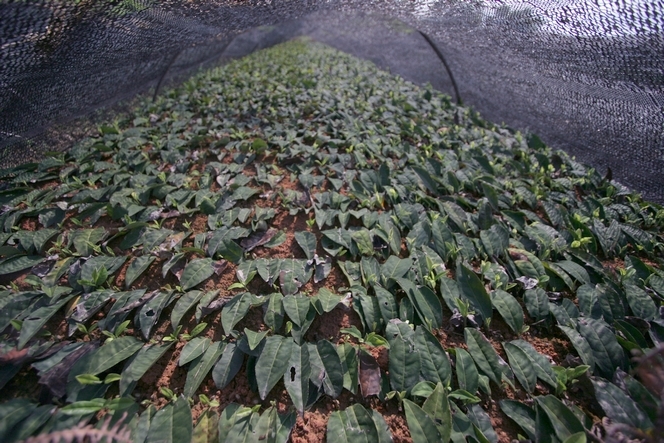 Once the grower has selected the good seeds, he buries them in plastic propagating bags filled with soil and fertilizer. 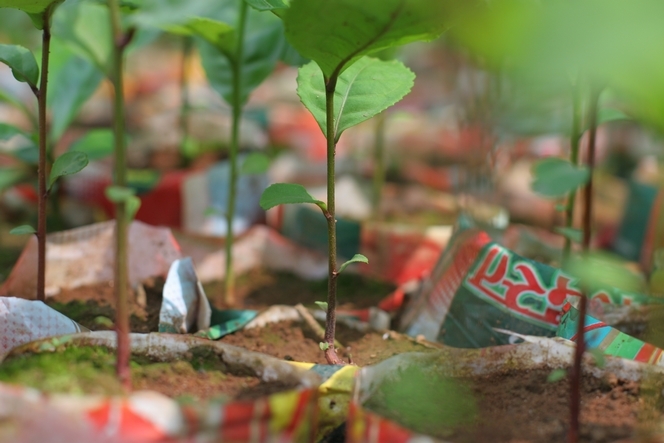 He places the bags in the shade and waits two years before planting the tea plants out into the ground. A year later, when they are three years old, the tea plants can start to be harvested. The tea plant doesn’t like a very dry climate or very strong sunshine. That’s why you often find tea growing in misty landscapes. 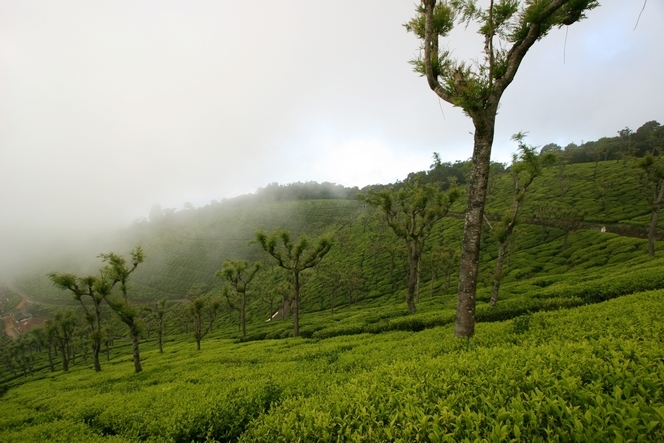 In a few minutes the weather changes, the hilltops disappear, the outlines of the trees become blurred, the temperature drops and you find yourself in the middle of a cloud, like here in Thiashola, a magnificent tea plantation in southern India. Flowers and seeds are all very well, but they’re not enough to make tea, which requires delicate care, patience, observation and constant attention. It’s a bit like love. And a bit like a blog: it needs looking after every day, smiling at, taking pleasure in giving one’s time. Indeed, here are some tea pluckers in conversation with their tea plants. They live just a few hundred metres away, and know every corner of the plot by heart. They know each tea plant, its strengths and weaknesses. They are concentrating hard and don’t allow themselves to be distracted by the photographer. 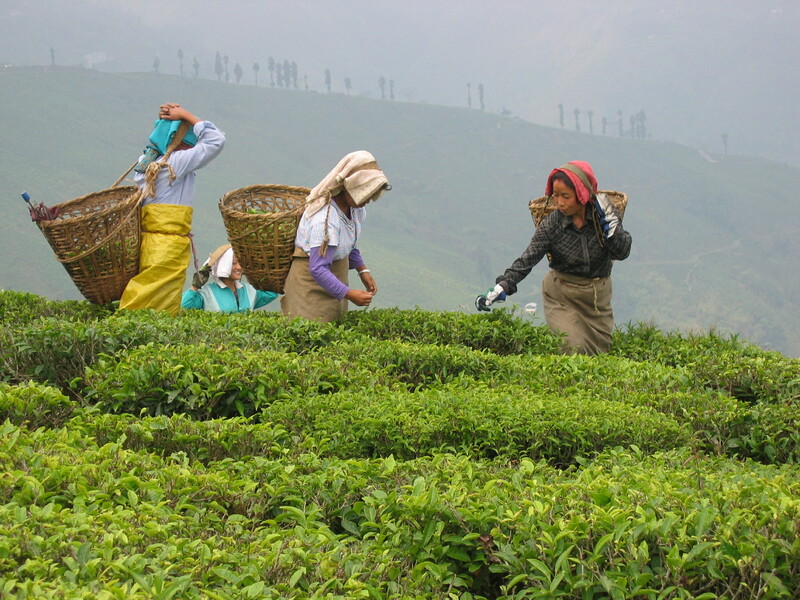 Photo taken in the indian tea plantation of Puttabong in Darjeeling (India). 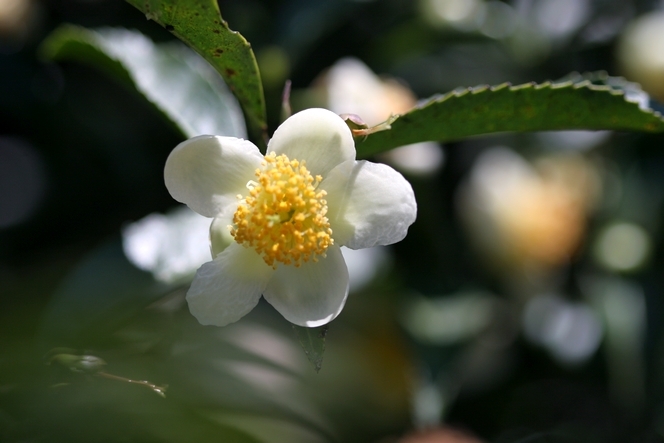 How could I have showed you the seed of the tea plant and not talked about the tea flower? So here it is, and if you’re thinking that it looks like a camellia, then you’re right, because the tea plant is a member of the large camellia family. In the tea plantations you see very few flowers. Because the young shoots are picked throughout the year, the tea plant is prevented from flowering, it is frustrated, you could say. The tea plant puts all its energy into growing leaves, so if you see a tea plant covered in flowers it’s not a good sign: it means the plantation is a bit neglected and the harvesting isn’t done regularly, or else it means that the tea plant is old, because a mass of flowers is a sign of degeneration. This pretty little tea flower I wanted to show you was found at the Happy Valley tea plantation not far from the city of Darjeeling in India. It doesn’t have much of a scent, it’s just pretty to look at, especially because its bloom fades quickly.